In our house, we have a two "no-thank-you-bites" rule. When we have a new food, the children must take at least two bites before they are allowed to say a polite "no thank you" and move on to something else. With the littlest, sometimes it goes like this "just take this bite and I'll leave you alone." Sometimes, with the biggest, it goes like this "I didn't see you take two bites, take another one--SQUIRREL--oh, sorry honey, didn't see that one either, take another one..." and so on. The next time we have that particular food, they have to eat it if that is what we are having for dinner. That being said, you have to know your children. We have learned that Charleigh's favorite food is asparagus and that she really doesn't like meat (I keep telling her that she can be a vegetarian when she is 12, but until she will eat the right foods to get enough protein, she has to eat her meat). We have also learned that Dani is the only one in our family that doesn't like asparagus, so we don't make her eat it. Charleigh likes spinach raw, Dani likes it cooked. Each of them will not eat it the other way. So I stock the freezer with these little spinach pies for Dani and when we have asparagus for dinner, we just defrost a couple ("Five, because I am five years old, Mommy!") for Dani to eat. Just a little background for you...Dani was borderline anemic when she was a baby and even feeding her beef five times a week wasn't correcting it, so we were trying all iron-filled food. We started with spinach filled things, like quiche (check out that blog post here). Each time, she would say "I don't want the crust...I don't want the egg...I don't want the ham..." Then we tried spanakopita but she didn't want the crust. So we ended up with making these little spinach pies--kind of the filling of spanakopita but without the pastry (or the fuss, thank you baby girl for making my life a little easier here). Oh, and here is the cutest thing--she still calls feta cheese "marshmallow cheese," as she did when she was a toddler. Well, it does look like marshmallows! My little photobomber...I can't get her out of pictures when I'm cooking. When photographer Daddy wants to take pictures, she will not cooperate--Yay 3-year-olds! Chop and saute onion. In the past, I have tried to hide this step from the biggest. She thinks she doesn't line onions. This time, she saw me and I told her that I was making some spinach pies for me and I like onions. Then I took a HUGE risk...I asked her "can I tell you a secret? I've been making yours with onions for a long time now. I just cut them up really small so you don't see them. Can I make yours with onions this time?" I held my breath for a beat or two...then she shrugged an okay and left the kitchen. Phew! Squeeze the water out of the spinach and set aside in a bowl. I used to do this with a towel. Now I just do it by the handful, it is actually less messy that way. To get the rest of the water out of the spinach, toss with the onions in the skillet for a few minutes. Place back in bowl to cool and add oregano, lemon zest, parsley and a pinch of nutmeg. Stir in feta, parmasen, and eggs, stir to combine. Remind your husband that there is raw egg in there as he tries to eat the feta out of the bowl. Scoop into a greased mini muffin tin. Preheat oven to 350. Squeeze the water out of the spinach and set aside in a large bowl. Saute the onion in the olive oil until softened. Use your fingers to separate the spinach a bit and add to skillet for a minute or two (just to dry it out a little more). Add oregeno, nutmeg, salt, pepper, parsley and lemon zest to the spinach and toss to combine. Place back in the bowl and let it cool a bit. Add feta, parmesan, and eggs and stir. Spray a mini muffin tin with non-stick spray. (This recipe makes 36 pies, stuffing the tins full. You can easily stretch it out into 48 pies) Fill each tin to the top with the spinach mixture. Bake 15-20 minutes til golden brown on the edges. Serve warm or let cool completely and freeze. To defrost when frozen, heat 5 pies on a plate for 1 minute at 50% power. As I write this, my children are being forced to enjoy my mother's vegetable beef soup. Mother Nature saw fit to dump yet another winter storm on us...8 inches this time. So in between shoveling and playing in the snow, I was working on this soup. It is super simple and remarkably delicious. And if you pour off all of the broth, a three year old will eat it. Only if you feed it to her like a baby. And she will chew the beef for five minutes like it is a piece of bubble gum, even though it is possibly the tenderest piece of meat I've made in awhile. Gather ingredients...let the meat stand at room temperature for a bit before cooking so it warms up. About 5 minutes each side--you are looking for a good crust on it. Add beef broth, bring to a boil and reduce heat to low. Simmer until the meat is fall-apart tender, 2-3 hours. I like to slice the cabbage into thin strips. It ends up being like noodles in the finished soup. Remove meat to a plate and cool until you can handle it. Pour vegetable juice into pot. Add tomatoes, soup mix and cabbage. Bring to boil, reduce heat to low and simmer at least 20 minutes. Shred the meat or cut into bite sized pieces and add back to the pot. Season the beef on both sides with salt. In a heavy bottomed pot (dutch oven) sear the beef in 3 Tbs vegetable oil over medium-high heat, about 5 minutes per side. Add beef broth to pot, enough to come up about 3/4 the way up the side of the beef. Bring to a boil and reduce heat to low. Simmer until beef is fall-apart tender. (My 2.8 lb piece took 2 hours, 45 minutes) Remove beef to a plate and allow to cool enough to handle. Meanwhile, add to pot the vegetable juice, tomatoes, soup mix and cabbage. Bring to a boil and reduce to low. Simmer at least 20 minutes until the cabbage is softened, but you can let it go longer if you wish. Shred or cut the beef into bite sized pieces. At some point during the simmering, add the beef back to the pot. Serve while hot, or it's even better the next day. After the soup has refrigerated a bit, you can remove the hardened fat. This soup freezes beautifully, so don't be overwhelmed by the vat of soup on your stove right now. We have ice cream and chocolate dipped sugar cones covered, but what about cupcakes? I've made full size ice cream cone cupcakes...small ones--even better, especially when the kids will be eating ice cream too. So preheat your oven to 350, mix up a cake mix, line up the cones on a cookie sheet (the little ones actually stand up better than the big ones do), fill the cups 2/3 with batter and bake 15 minutes. Easy-peasy. They are so small that from turning the oven on to icing and sprinkles was a few minutes shy of an hour. Well, that's better, they are about the size of a shot glass. Cute. Cute. Cute. All ready for tomorrow. So I promised this recipe last night...didn't happen, but the final episode of season 2 House of Cards did. Love binge watching, but so sad when we run out of episodes! Anyway, the inspiration for this dish was a yummy concoction hubby and I had on an anniversary trip to Williamsburg two years ago. It was a special at one of the restaurants where we had dinner. Hubby ordered it, I couldn't stop eating it. They stuffed it with barley, sausage, some veggies and topped it with what we deduced was a creamy balsamic syrup. The savory stuffing was a nice contrast to the sweet squash and syrup. If you have read my book (thank you), you know we usually make acorn squash with butter and brown sugar (and Grand Marnier for hubby). I grew up eating it that way--you cook the squash then put a pat of butter and a couple tablespoons brown sugar in the cavity (and brush some Grand Marnier around the rim for the hubby). We got our kids eating it by calling it candy squash. Whatever it takes, right? We tried to recall everything that was in the dish from Williamsburg, but neither one of us could truly remember. Back in the fall, I tried two different combinations in the filing, this spinach / mushroom / goat cheese was the hubby's favorite. It might be because we are putting goat cheese on everything right now. Even at restaurants, we'll look at each other "you know what this needs...goat cheese." Cut squash in half and scoop out the seeds. Try to make sure that your two halves will sit up straight. If not, slice a tiny sliver off the bottoms to make a level bottom. Brush cut sides with olive oil, salt and pepper. Roast cut side up in a shallow dish at 350 about 40 minutes. Meanwhile, cook quinoa according to your package directions. Mine said to rinse, then cook with a 2 parts liquid to 1 part quinoa. I made double what I needed for the recipe and I used vegetable broth. I will portion and freeze the remainder for another use. Cook sausage over medium-high heat until brown and cooked through, remove from pan. I've used a roll of breakfast sausage in the past. This time, I used a mix of hot and sweet Italian sausage. Add pepper and onions and cook until slightly tender, about 5 minutes. Then remove from pan--add to sausage in a bowl. This is the sausage, peppers and onions waiting for me. I made enough for four servings, but I only had one acorn squash. (Bonus...I used half of this sausage and pepper mixture with a small can of mushrooms in half a jar of Ragu. Poured that over some al dente penne mixed with ricotta cheese, topped it all with a handful of mozzarella and baked it for about 20 minutes. Easy weeknight dinner last night). Add spinach and toss to wilt. Well, that was fast. And look how much that spinach cooks down. Add sausage / peppers back to pan. Stir in quinoa. Brush cut side of cooked squash with maple syrup. Fill cavities with the sausage / quinoa filling. Bake at 350 til golden and hot through, about 20 minutes. Sometimes we top it with an extra drizzle of syrup. 2 Acorn squash, halved and seeded. Preheat oven to 350. Place squash in a shallow dish and brush cut edge and cavity with olive oil. Sprinkle with salt and pepper. Roast 40 minutes in the oven. Meanwhile, place quinoa and liquid of choice in a covered saucepan. Bring to a boil, reduce heat and simmer 15 minutes until liquid is absorbed. Cook sausage in a skillet over medium-high heat until cooked through. Remove sausage from pan and place in a bowl. Place peppers and onions in skillet and cook over medium heat until softened, about 5 minutes. Place peppers and onions in bowl with sausage. Cook mushrooms in skillet over medium heat (add extra olive oil if necessary) about 5 minutes. Add spinach and toss until wilted. Add sausage and peppers back to skillet with spinach and mushrooms. Stir in quinoa and goat cheese. Brush cooked squash with syrup and fill cavities with sausage / quinoa mixture. Bake in oven about 20 minutes until browned a bit and heated through. I am so looking forward to spring. This has been the strangest winter the east coast has seen in awhile. It has been bitterly cold. So unusually cold that I've been carrying around extra snow pants and blankets for the kids in the car, just in case we'd get stuck and have to walk somewhere. Blech, and the snow...I actually like snow, but it has to be more than 4 degrees outside if you want to play in it. And frankly, I am tired of waking up at 4:30 in the morning to make a decision on if my employees could sleep in or brave the icy tundra and get to work. Rant over. Here is what I'm going to miss about winter...the food. Yeah, I know that you can make a beef stew in the summer, but who really wants to? While I am already dreaming of corn on the cob and zucchini, I am making my last effort on the winter food front. Roasted Brussels Sprouts and Stuffed Acorn Squash (check back tomorrow for the Acorn Squash recipe). The Brussels Sprouts were quite the hit on my facebook page last year. When the Ravens were in the playoffs last year, I had my own little superstitious ritual going on. These Brussels sprouts were my "game day food." While other people were making wings and dips, I was getting my roast on. Every time I made them during a game, the Ravens won...all the way through the Super Bowl. A few playoff games in, I posted a picture on facebook. I am amazed at the number of people that like Brussels sprouts. More than once, I had to post the recipe. Here it is, so it will always be available...enjoy! Go Ravens! Trim and cut the Brussels sprouts to about equal sizes. The ones that are the size of a quarter get halved; the half-dollar sized ones get quartered. Does that make sense? Toss on a cookie sheet with chopped onion and diced bacon. Drizzle with olive oil, pepper and just a bit of salt. Roast at 425 for 20 to 25 minutes. The sprouts will get wonderfully brown. I usually let the bacon tell me when the sprouts are done. Finish with a pat of butter, a squeeze of lemon juice and a squirt of honey. Preheat oven to 425. Toss Brussels sprouts, onion, bacon, olive oil, salt and pepper on cookie sheet. Roast in oven for 20-25 minuets, stirring every 10 minutes. Remove from oven, stir with butter, lemon juice and honey. Don't you just love the combination of mushrooms and thyme? I do. I start many dishes with this combination--creamy mushroom soup, mushrooms julienne (a Russian dish with lots of Gruyere), even my Mostly Veggie Steak Sandwiches will get a healthy dose of thyme if we have any in the fridge. So in deciding on a pre-spa birthday brunch dish for a part-time-vegetarian friend, I came up with this tart. 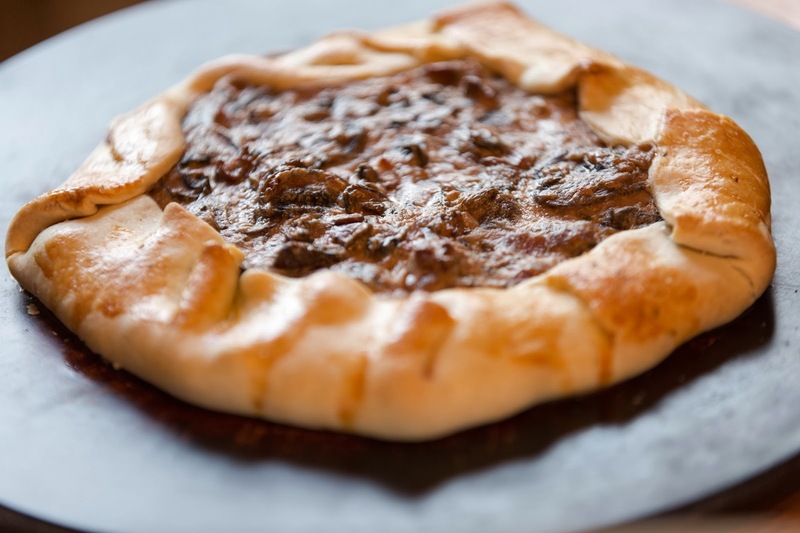 I did find inspiration here: creamy mushroom tart, but going with ingredients on hand, this is what I came up with. When I prepared it the night before, hubby was quite upset that he couldn't partake. I had to make another one for him the next day. Luckily, refrigerated pie crusts come in a two-pack. Over the past six months, the recipe has evolved to what you see below. Last month, I made it meatless (no bacon) while I was recovering from strep throat. Hubby thought that the bacon might scratch on the way down. He was probably right. I was worried about missing the smoky flavor, so that is when I started using smoked cheese and red wine...it almost (said the full-time carnivore) made up for the bacon. I originally started to make this tart the other day with the softened cream cheese I didn't use in muffins. But no bacon...and it was snowing...so it was Apple Pear Pie on Monday, Mushroom tart today. Cook bacon over medium heat til crispy. You want bacon now don't you? Take out the bacon and leave a bit of grease in the skillet. Cook mushrooms, shallots, thyme in the bacon grease until mushrooms are tender. Season with salt and pepper. Add wine and reduce almost completely. Add cream cheese, stir until melted. Stir in reserved bacon and smoked Gouda. 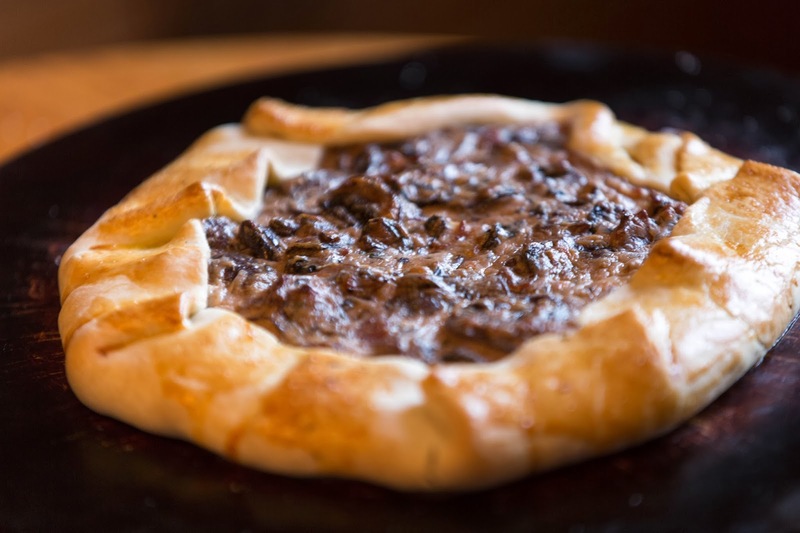 Place mushroom mixture on pie crust. Fold up edges, brush with egg wash and season with herb salt. Bake 20 minutes at 375 until golden brown. It is very rich, serve it with a green salad dressed with a simple vinaigrette. Bonus professional shot...thank you honey! Cook bacon in a 10-12 inch skillet over medium heat until crisp. Remove bacon to a paper towel, reserving the drippings in the skillet. Pour off about half the drippings, leaving a couple of tablespoons in the skillet. Add mushrooms and cook about 5 minutes until tender. Stir in thyme, shallots, salt and pepper and cook another 3 minutes. Stir in wine and cook until reduced almost completely. Reduce heat and stir in cream cheese until melted. Add smoked Gouda and bacon pieces and stir to combine. Unroll pie crust onto a cookie sheet or pizza stone. Place mushroom mixture in center of pie crust, leaving about 1 1/2 inch border. Fold the rim of pie crust over the edge of the mushroom mixture. Brush top edge of pie crust with egg wash. Sprinkle with herb salt. Bake 20 minutes until the crust is golden brown. Let stand for 10-15 minutes before cutting. Serve warm or room temperature. Mix all ingredients. Place in a pepper grinder, set to medium grind. Use on savory pies, pizza crust, focaccia, scrambled eggs, anywhere you want some extra flavor.